Solid hardwood timber flooring is processed from 100% real hardwood .The timber flooring board is cutting from lumbers in random length but same thickness.Before the timber board being processed as hardwood timber flooring,all timber board after cutting from lumbers will be put in Kiln Dried Equipment for a specified period of time in certain temperature and humidity conditions.Kiln Dried solid timber board will be milled on machines with beveled edge & T&G joint as unfinished solid timber flooring. 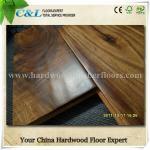 Currently in different countries worldwide, solid timber used for hardwood flooring can be a wide of selection.Generally tropical hardwood from Southeast Asia ,Africa and South America are the mainstream wood material for solid wood flooring with good quality in many different wood species like teak, cumaru, brazilian cherry, kempas, merbau, Santos mahogany, Ipe, Iroko etc. While in Europe and Russia, Oak, beech, ash are the mainstream wood used for processing hardwood flooring, particular for Oak, it has been the No.1 in timber flooring market worldwide. 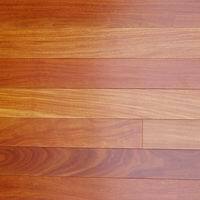 Wood is a natural material with natural features in color tones.For different timber species, the colors varations are more or less different, some is light, some is heavy. 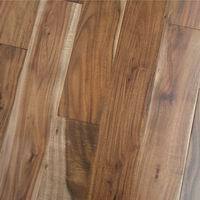 So before make purchase of solid timber flooring, be aware of what colors you want to present in your rooms, choose the most suitable wood species with either consistent color varation or more contrasting dark & light color tones. Hardness is one of the most critical factors to evaluate the quality of solid timber floor. Wood with higher janka harness is usually has higher dent ressitance to home traffic. Oak is taken as standard with Janka Hardness 1450psi, while many imported hardwood from Brazil or Africa is much better than oak in hardness. 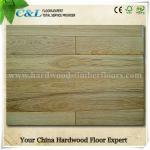 Most of solid timber floor board comes in a very shallow groove when two pieces of board joint together. 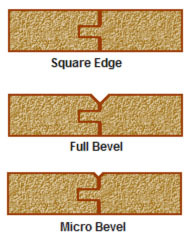 This is what we called Micro-Beveled Edge. 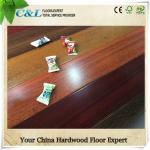 Wood flooring industry standard for hardwood flooring Moisture Content is Below 12%, in some hot and dry regions,9-10% is possible. It should be requested in advance by client before production. 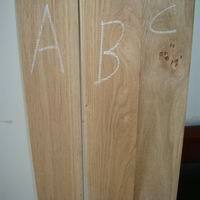 Timber grades for flooring are categoried with Prmier Grade,Selected Grade & Character Grade. 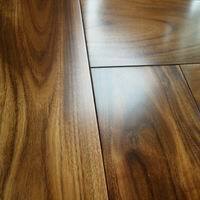 Solid timber flooring surface with Gloss level 30%,45% & 60%, low gloss,medium gloss or high gloss. 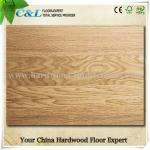 Hardwood timber floor comes with Smooth ,handscraped & brushed styles. 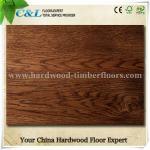 Strip timber floor size: 710x75x18mm,610x75x18mm etc.